Actually, you've reminded me of the ILLEGAL and naughty act I've got planned for later today. The house across the street from us has a lemon tree that's hanging over the fence into their poo cart lane and I'm going to go over there, do a few commando rolls behind wheelie bins and parked cars and steal some! Yeah!! And I though you were the good one! Maybe you'll inspire some local Sherlock and his/her dog to solve "The Mystery of the Vanishing Lemons". But no. If it's hanging over the fence its fair game. Man I want to see Kath do a commando roll . .she can you know! Personally I like a little Gin and Tonic with my lemons! Lemon cordial with ice is reason enough to steal. I say go for it, should only be a minor prison sentence anyway. I once made Christmas hampers for my 4 best friends consisting entirely of lemonly treats. 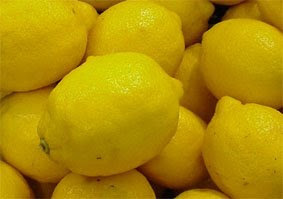 Nothing but lemon flavoured, lemon smelling, lemon looking lovliness and boy did they go down a lemony treat. Why? Because lemons are legend and lemon cordial is just one delight to be derived from the humble lemon, stolen or legimately obtained.